Ficant supports a population of fewer than 10,000 sophonts. It is a member of Third Imperium in the Vilis Subsector of Spinward Marches Sector and in the Domain of Deneb. Ficant, as a member world of the Third Imperium, holds the estate of an Imperial knight, a member of the Imperial Nobility charged with overseeing the world. Ficant is a world suited to becoming an agricultural world, but with a population between 10,000 and 100,000 sophonts, but lacks the capability to produce or process sufficient resources to export its projected agricultural produce. It is a member of Regency of Deneb in the Vilis Subsector of Spinward Marches Sector. Despite being almost a garden world, Ficant has never been targeted for significant colonization. Diameter: 5,222 miles (8,400 km). Netali is only 2 billion years old and has a white dwarf companion (Netali bis) orbiting at 10AU. Ficant's youth has prevented it from becoming fully tidally locked to its primary. However it is expected that it will become tidally locked within the next 500 million years, at which point its atmosphere's volatiles will freeze out on the night side and the planet will die. Despite this, the world has evolved a thriving ecosystem with a wide range of primitive flora and fauna (very roughly equivalent to Earth's Carboniferous period) and is of considerable interest to biologists. Non-canon: Ficant is an unremarkable Imperial world near the Sword Worlds border. It orbits Netali, an main sequence M0 class star at a distance of 0.35AU. Ficant is a small world with oceans covering 69% of its surface. Despite its cool climate it does not posses extensive polar ice caps as none of its five continents are located in the polar regions, thus preventing their formation. This lack of ice caps has contributed to keeping its overall albedo low and results in a climate far warmer than would normally be expected. One curious fact is its surprisingly high atmospheric pressure given its small size, but like much on the world, this has not yet been investigated and no plausible explanation has been advanced. Non-canon: Ficant's indigenous life has only developed to a primitive state. As might be expected, life on Ficant originated in the seas and they now posses a rich variety of life forms. However, the "invasion" of the land has only just begun and Ficant has few native land animals other than invertebrates. Much of the planet's landmass is covered by massive bogs and swamps of tree sized spore propagating plants (similar to terrestrial club-mosses, ferns and horsetails). Forests of primitive seeding trees dominate the remainder. It is expected that the world's combination of low gravity and high atmospheric pressure will lead to the evolution of a wide variety of aerial life, but as yet only a few species have taken to the air (mostly invertebrates). This combination of low gravity and high pressure has also lead to the evolution of a number of triphibian creatures. Ficant's swamps and bogs teem with life. The wetlands are covered in a thick layer of rich decaying organic material and support a vast array of creatures; ranging from tiny invertebrates to massive amphibians such as the Arngalds. This dense organic soup also produces a number of valuable chemical compounds and provides the planet's sole source of off-world income. Much of the world remains unexplored and only a tiny hand-full of Ficant's creatures have yet been classified. Despite the scarcity of large land animals, Ficant's has a diverse range of amphibian creatures, some of which grow to quite respectable size. Many of these amphibians are aggressive carnivores and travel through these areas can be quite hazardous. The largest thus far discovered is the Svensson's Arngald. This creature can grow up to 18 meters in length and mass over 300 kilograms and has no hesitation in attacking humans. In addition to its native flora and fauna, several species of off-world plants and animals have been introduced (either deliberately or by accident). These off-world species have thrived on Ficant and indeed are replacing many native species around the areas of human settlement. Recently Ficant's Governing Council introduced strict control on the importation of off-world life forms in an attempt to protect the native ecosystem. Ficant, as a member world of the Third Imperium has a member of the Imperial Nobility overseeing the world. Most of Ficant's inhabitants make their living by harvesting the rich organics found in the equatorial swamps. Human settlement on Ficant is limited to the lush equatorial coastal swamps. Here warm ocean currents combine with the equatorial climate to produce a pleasant Earth like environment. The biological basis of Ficant's life is extremely similar to that of Terra and all human dietary needs can be met from the local ecosystem. 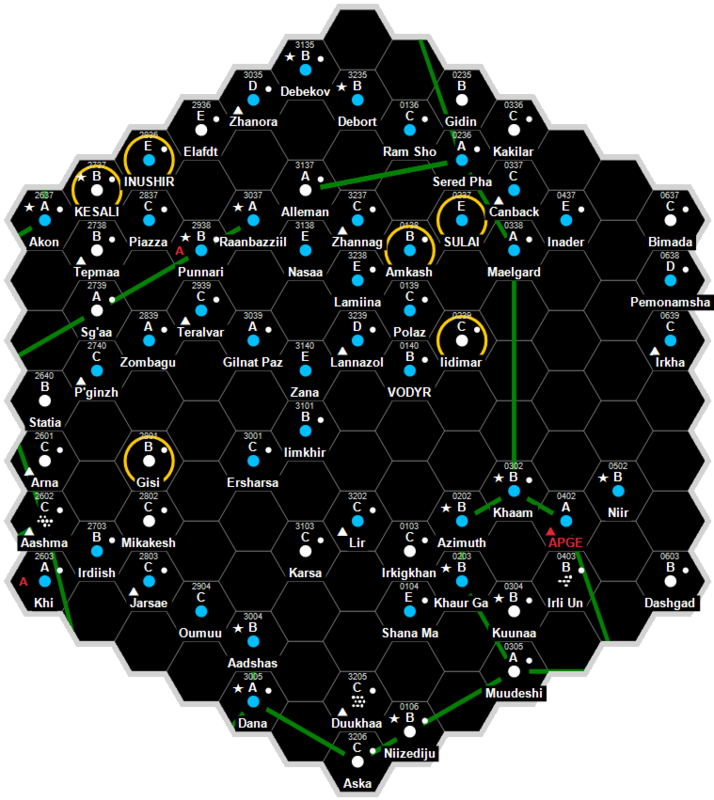 The largest settlement on Ficant is Atterdag, location of the world's E class starport. Atterdag is quiet agricultural town of some 2,400 inhabitants. Located here is the entirety of the world's limited manufacturing capacity, which consists of a few light-engineering workshops. Atterdag's economy is based around servicing the needs of the planet's widely spread population. It is also the seat of the Ficant Governing Council, providing Ficant with administrative services and handling offworld contacts. The majority of the population lives in back country homesteads and makes their living extracting valuable organic material from Ficant's coastal swamps. The usual homestead consists of a single family of two to three adults with a similar number of children. Usually four or five homesteads will be clustered in the same general area and they will share harvesting grounds and pool resources to increase their efficiency. The people of Ficant are generally conservative and honest. Having little contact with offworld culture they appear to most uninformed travellers as either quaint or hopelessly insular, caring little for technological advancement or personal aggrandizement. This opinion is mistaken. Most natives see the advantages of high tech tools, but the world's restricted industrial base severely limits their usefulness. Many Ficant natives travel offworld to attend higher education and the world has a strong tradition of military service (approximately 35% of the world's population has served a term or two in the Imperial armed forces). However, most of the population are content with their lives and find the faster pace of Imperial culture unsettling and consequently prefer to remain at home. Non-canon: Human colonisation has been limited to one of the smaller continents straddling the equator. The first human settlers are thought to have arrived around 450. It is not known for certain where these settlers came from, as this was not an organized colonisation effort, but it is believed that they originated from the Sword Worlds. This disorganised settlement continued for the next 150 years and by 600 the population had grown to around 1,000. It was during the First Frontier War that the world first came to official notice. At this time a substantial proportion of the population was of Sword Worlds decent and Imperial forces came to regard it as a potential security threat. In 596. Grand Admiral Plankwell ordered Ficant's annexation. With its incorporation into the Imperium an official colonisation program was envisaged and in 602 1,500 Imperial colonists arrived. It was intended that these were to be just the first wave of an intensive colonisation program, but with the outbreak of the Civil War this program was abandoned and no further official colonisation was to ever take place. From this point onwards, Ficant lapsed back into obscurity. Despite this official apathy, Ficant's population has continued to grow slowly and according to the census of 1120, it has a population of 9,250. This page was last modified on 16 December 2016, at 18:09.